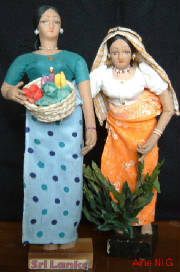 These little Sri Lankan dolls are exquisitely handcrafted. 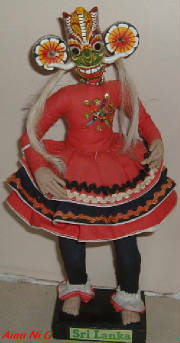 The bodies are brown cotton over a wire armature, the faces are pressed fabric with hand painted features, the fingers and toes of the dolls are individually sewn and some of the dolls have applied ears. They are approx. 10" high and come on a black wooden stand. 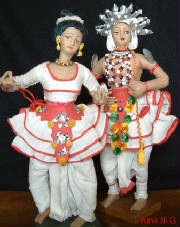 This Veddah couple is dressed in the hunting costume of the ancient inhabitants of the Island of Sri Lanka. 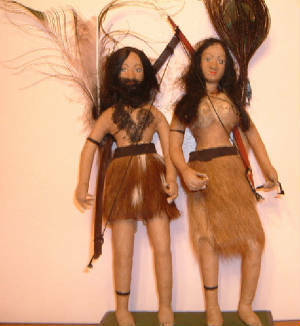 These primative looking dolls are 10" high, made of some sort of stiff cloth, with painted features, each doll is carrying a hunting bow and little carriers on their backs with peacock feathers and arrows. The Veddahs reside in the scrub jungles of Sri Lanka and are said to be the original inhabitants of the Island before the Sinhalese.